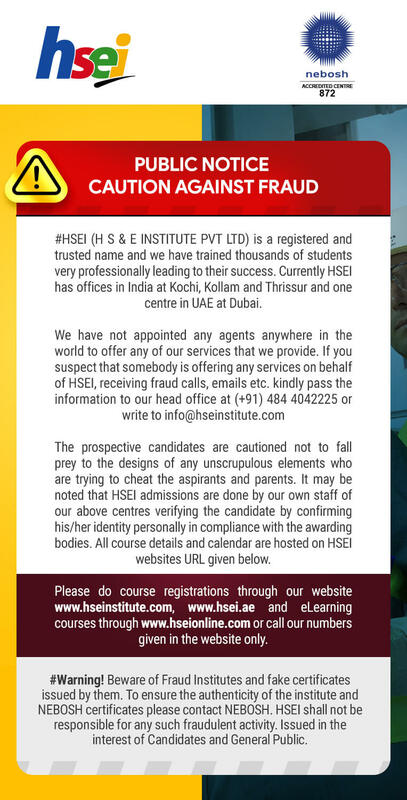 #HSEI (H S & E INSTITUTE PVT LTD) is a registered and trusted name and we have trained thousands of students very professionally leading to their success. Currently HSEI has offices in India at Kochi, Kollam and Thrissur and one centre in UAE at Dubai. The prospective candidates are cautioned not to fall prey to the designs of any unscrupulous elements who are trying to cheat the aspirants and parents. It may be noted that HSEI admissions are done by our own staff of our above centres verifying the candidate by confirming his/her identity personally in compliance with the awarding bodies. All course details and calendar are hosted on HSEI websites URL given below. Please do course registrations through our website www.hseinstitute.com, www.hsei.ae and eLearning courses through www.hseionline.com or call our numbers given in the website only. #Warning! Beware of Fraud Institutes and fake certificates issued by them. To ensure the authenticity of the institute and NEBOSH certificates please contact NEBOSH. HSEI shall not be responsible for any such fraudulent activity. Issued in the interest of Candidates and General Public.